We’ve talked about ecotourism, and mentioned some popular ecotourism destinations across the globe. But what if you don’t want to go overseas? The United States offers plenty of ecotourism opportunities, both in the continental states and in Hawaii and Alaska. Again, the International EcoTourism Society is a great resource for finding legitimate organizations, and they offer great advice on what to do while you’re traveling. Below are some regions in the United States with pristine regions and fascinating ecosystems – definitely worthy of being a vacation destination! Active volcanoes, whale watching, wildflower meadows, ecological regeneration – Washington State has it all! Visit Puget Sound to go on a whale-watching boat ride or spend time on the San Juan Islands. Or head over to Mount St. Helens to see the destruction wrought by a volcano – and how the land and animals are recovering from the damage. Mt. 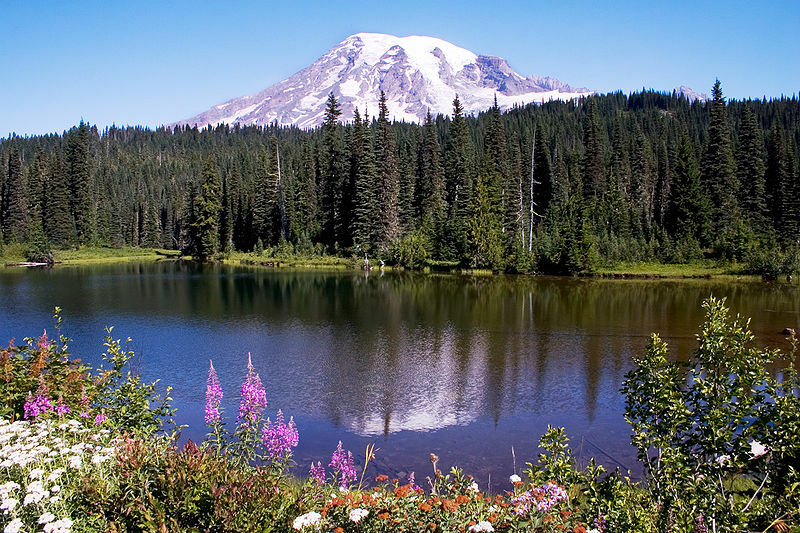 Rainier is stunning year round, and the variety of hiking trails and vistas is worth a several-day stay. Wherever in Washington State you go, you’ll be surrounded by the natural beauty of the Pacific Northwest, and you probably won’t want to leave! See the Northern Lights, follow the Iditarod Trail, visit the tallest mountain in the United States, observe and learn about the migratory habits of Alaskan mammals – this wild state is full of opportunities to enjoy the natural world without impacting it. With a long list of outdoor activities and a variety of vouched-for organizaitons, Visit Wild Alaska is a great resource for planning your trip. More volcanoes, birding, biking, snorkeling, scuba diving, whale watching; the list of ecotourism opportunities in Hawaii seems endless! The Hawaii EcoTourism Association has a great list of green tips for your vacation in Hawaii. Eat locally to get the freshest, most sustainable food; don’t walk or stand on coral as that weight and pressure can kill the living organism; don’t feed the animals, human food isn’t good for them; watch wildlife responsibly, so they can continue to flourish and others can enjoy them as well. The Appalachian Mountains that run up and down the East Coast aren’t often thought of when discussing ecotourism. But the series of state and national parks make for excellent, low-impact vacation spots. North Carolina contains one of the United States’ few temperate rain forests, and the wildlife found throughout the mountain chain includes bears, wild turkeys, hawks, groundhogs, and more. Whether you’re biking a mountain trail or taking a kayak down the Chattooga River, the scenery and the mountain air will be breathtaking. There are plenty of accessible destinations in the United States that pride themselves on their natural beauty and wildlife. Explore the nation, and revel in our own ecological wonders!